Pathfinder Flip-Tiles: Dungeon Starter Set - Meet the perfect tool for dungeon delving! Next time your players are ready to explore a dungeon's depths, they won't have to wait for you to draw every twist and turn of a subterranean labyrinth. Pathfinder Flip-Tiles: Dungeon Starter Set provides beautifully illustrated 6" × 6" map tiles that can be used to construct a variety of dungeon corridors, rooms, and other sites. Inside, you'll find 42 richly crafted, double-sided map tiles and six tabbed dividers to keep them organized. This starter set is only the first step! 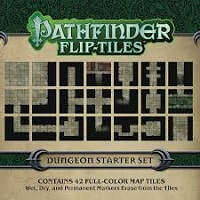 Flip-Tiles expansion sets allow you to expand your dungeon both in size and with nearly endless variety! So stop your sketching and start your flipping today! 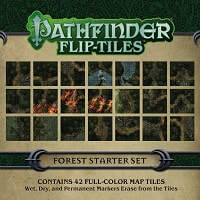 Pathfinder Flip-Tiles: Forest Starter Set - More tiles! More options! New size! Create winding forests with just a flip! The new and convenient Flip-Tiles: Forest Starter Set features 42 full-color 6 x 6-inch map tiles, with forest paths and clearings on each side, all stunningly crafted by cartographer Jason A. Engle. These exciting new tiles put wilderness adventure in your hands! Suitable for experienced GMs and novices alike, this product fits perfectly into any Game Master's arsenal. Wet, dry, and permanent markers erase from the tiles! These double-sided forest tiles come in convenient packaging for easy storage. Take your campaigns to the next level! 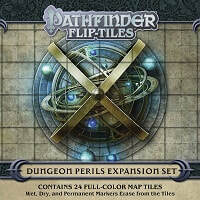 Pathfinder Flip-Tiles: Dungeon Perils Expansion Set - Perils in Every Room and at Every Turn! Dungeons just became more perilous! Next time your players are ready to explore a dungeon's depths, they won't have to wait for you to draw every twist and turn of your horror-filled tomb. Pathfinder Flip-Tiles: Dungeon Perils Expansion Set provides beautifully illustrated 6" × 6" map tiles that can be used to stock your dungeon with a variety of tricks, traps, hazards, and strange sites of interest. Inside, you'll find 24 richly crafted, double-sided map tiles. This expansion set, along with Pathfinder Flip-Tiles: Dungeon Starter Set, allows you to create dangerous dungeons with endless variety! So stop your sketching and start your flipping today! The Dungeon Perils Expansion Set includes: Chasms, Collapses, Evil Altar, Fungus Growths, Magic Device and Trapped Corridors. 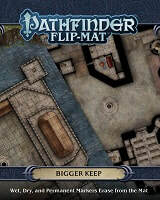 Pathfinder Flip-Mat: Bigger Basic - A dungeon filled with insidious traps, a magnificent imperial throne room, the citadel of an immortal tyrant—the possibilities for adventure are endless with Pathfinder Flip-Mat: Bigger Basic. With an area that's a whole 45% larger than Pathfinder Flip-Mat: Basic at their disposal, Game Masters can now dream even bigger! This massive gaming accessory presents two subtle textures—smooth stone and fine dirt—on which Game Masters can design any dungeon, battleground, or adventure set piece they desire. Don't feel like you always have to run your game in someone else's pre-designed world. 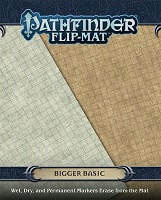 With Pathfinder Flip-Mat: Bigger Basic, the setting of your next adventure is yours to create! Fully laid out, Flip-Mat: Bigger Basic measures 27 by 39 inches, but folds down to a convenient and portable 8 by 10 inches—easy enough to toss into your bag for the game! Its coated surface can handle any dry erase, wet erase, or even permanent marker. Usable by experienced GMs and novices alike, Pathfinder Flip-Mats fit perfectly into any Game Master's arsenal! 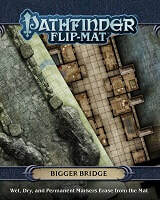 Pathfinder Flip-Mat: Bigger Bridge - Whether players are traversing a giant's byway on a high mountain pass or braving the bustle of a cosmopolitan span, the possibilities for adventure are endless with Pathfinder Flip-Mat: Bigger Bridge. With an area that's 45% larger than normal Pathfinder Flip-Mats at their disposal, Game Masters can now dream even bigger! This massive gaming accessory presents a wide causeway over a perilous mountain drop and a city bridge complete with shops and workshops teetering on its edges. Don't waste your time drawing every pylon, tower, and crenelation. With Pathfinder Flip-Mat: Bigger Bridge, you'll be ready next time your players want to explore the wilderness or the city! 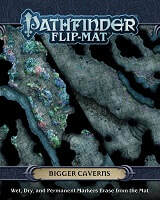 Pathfinder Flip-Mat: Bigger Caverns - Whether players are seeking buried treasure or hunting creatures that haunt lightless underground complexes, the possibilities for adventure are endless with Pathfinder Flip-Mat: Bigger Caverns. With an area that's 45% larger than Pathfinder Flip-Mat: Twisted Caverns at their disposal, Game Masters can now dream even bigger! This massive gaming accessory presents an extensive cave system, complete with underground rivers, deep chasms, oubliettes, collapsing passages, subterranean flora, and other terrors for impetuous adventurers. Don't waste your time drawing every ledge and craggy corner. With Pathfinder Flip-Mat: Bigger Caverns, you'll be prepared the next time your players set out into the bowels of the earth! Pathfinder Flip-Mat: Bigger Dungeon - Step into a massive dungeon complete with a temple chamber, a bloodstained altar, and a ziggurat topped with a crystal skull—the possibilities for adventure are endless with Pathfinder Flip-Mat: Bigger Dungeon. With an area that's a whole 45% larger than Pathfinder Flip-Mat: Ancient Dungeon at their disposal, Game Masters can now dream even bigger! This massive gaming accessory presents both exterior and interior views of this underground complex, which can be home to everything from ancient cults to thieves' guilds to monsters that thrive in the dark. Don't waste your time drawing every dank room and twisty passage. 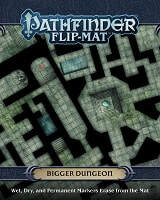 With Pathfinder Flip-Mat: Bigger Dungeon, you'll be ready the next time your players delve the dungeons deep! Pathfinder Flip-Mat: Bigger Keep - A Mightier Fortress! Whether players are infiltrating an enemy stronghold or defending against invading troops, the possibilities for adventure are endless with Pathfinder Flip-Mat: Bigger Keep. With an area that's 45% larger than normal Pathfinder Flip-Mats at their disposal, Game Masters can now dream even bigger! This massive gaming accessory presents an extensive multi-level keep, complete with an armory, arrow slits, a drilling yard, guard towers, a mess hall, a moat, and a shrine for valiant defenders. Don't waste your time drawing every turret, drawbridge, and crenelation. With Pathfinder Flip-Mat: Bigger Keep, you'll be prepared the next time your players decide to scale the walls! 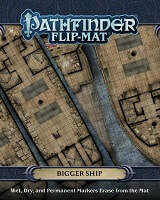 Pathfinder Flip-Mat: Bigger Ship - Whether smuggling cargo, boarding and plundering a prize, or sailing in style, the possibilities for adventure are endless with Pathfinder Flip-Mat: Bigger Ship. With an area that's 45% larger than Pathfinder Flip-Mat: Warship at their disposal, Game Masters can now dream even bigger! This massive gaming accessory presents multiple decks of a richly appointed galleon, which could be home to common sailors, naval officers, and nobles on royal business—and targeted by enemy navies, pirates, or monsters from the deep! Don't waste your time drawing every cabin and hold. With Pathfinder Flip-Mat: Bigger Ship, you'll be prepared the next time your players make ready to set sail! Bigger Size! Pathfinder Flip-Mat: Bigger Ship measures 27 by 39 inches, which gives you 45% more gaming space than the standard Pathfinder Flip-Mat. Pathfinder Flip-Mat: Bigger Tavern - Step into a tavern complex complete with rooms for travelers, extensive stables, and a forge for those wanderers who need to replace their weapons—the possibilities for adventure are endless with Pathfinder Flip-Mat: Bigger Tavern. With an area that's a whole 45% larger than Pathfinder Flip-Mat: Tavern at their disposal, Game Masters can now dream even bigger! This massive gaming accessory presents both exterior and interior views of this roadside way station, which can be either a sanctuary where weary travelers can restock or a trap for unwary adventurers. Don't waste your time drawing every pub table and inn room. 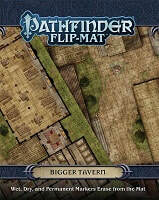 With Pathfinder Flip-Mat: Bigger Tavern, you'll be ready the next time your players belly up to the bar! 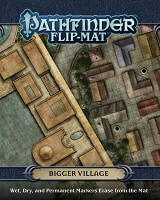 Pathfinder Flip-Mat: Bigger Village - Whether your players are exploring some far-flung desert market or defending a village nestled within the hill country from a horde of rampaging orcs, Pathfinder Flip-Mat: Bigger Village has you covered. With an area that's 45% larger than normal Pathfinder Flip-Mats at their disposal, Game Masters can now dream even bigger! This massive gaming accessory provides a pair of large villages ready for discovery, defense, exploration, and maybe a bit of shenanigans and larceny. It's all up to you and your players.